Download OST Mera Yaar Mila Dey which has been sung by Rahat Fateh Ali Khan and composed by Waqar Ali. Lyrics of Mera yaar Mila Day has been written by Sabir Zafar. The cast of Mera yaar Mila Day includes almost all the famous name of Pakistani drama industry like Sajjal Ali, Faysal Qureshi, Ahmed Ali, Firdous Jamal and Sana Faysal. Probably if you look at the OST video of Mera yaar Mila Day, you will found that the story of drama is looking interesting. it is a love story between Sajjal, Faisal Qureshi and Ahmed Ali. Mera yaar Mila Day is going to telecast on Monday at 8 PM, the same timing when we are going to have Mann Mayal on Hum TV. 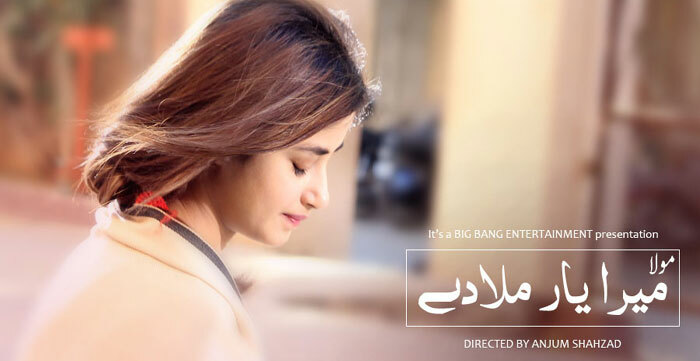 Well, you can watch one of your favorite drama online through drama online websites but ARy should not come up with new drama with such a good cast on Monday when they probably knows that Mann Mayal is being hit at the movement and it is almost impossible that people will leave Mann Mayal for Mera yaar Mila Day.